I'm back! Things are calming down for me now and I can finally get back to stamping and blogging! YAY! Today I'm going to share a project that I made around the time of the new annual catalog release. I have several customers who are not local and I have to mail out their catalogs to them. 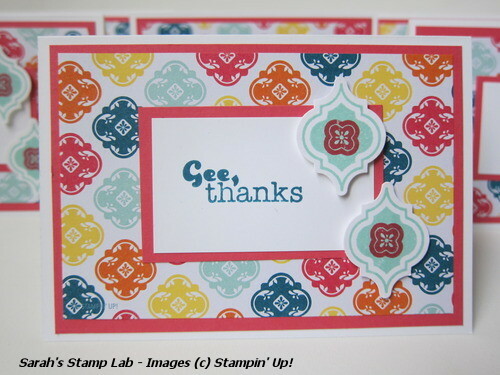 I thought a fun little thank you card would be a great surprise to add to the envie containing their catalog. I used the notecards and envelopes found in the annual catalog. I love these cards. They are great for making my thank your. They are slightly smaller than an A2 card - 5" x 3-1/2". You get 20 in a pack + envelopes. This is a great option when you need to mass produce a card and you do not mind the card base being in Whisper White. I always make sure to add lots of color to brighten them up! Here's a peek at the whole pile I made! The Quatrefancy Designer Series Paper is so bright and cheery! These cards are very nice. Great to have on hand. sarah these are suuuper cute!!! lucky customers! Gorgeous. I love the Quatrefancy paper; I must get it soon, as well as the whole bundle. It's awesome. Love the simplicity, very pretty!